The majority of today’s homebuyers instantly form an opinion about a property the second they lay eyes on it. Much like judging a book based on its cover, people tend to make snap judgements on real estate properties based on their appearance and surrounding neighborhoods. 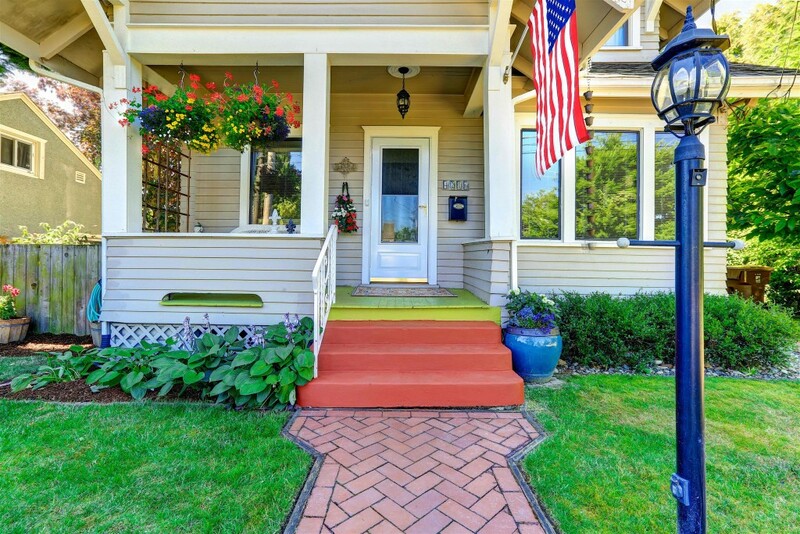 That said, the summer curb appeal trends of 2016 aim to do one thing: make a great first impression. First impressions are everything in real estate. If people are not impressed with the outside of a home, getting them to be impressed with the inside is very unlikely. If for nothing else, a negative sentiment can be attached to the property moving forward. Landscaping continues to be a popular fixture with annual summer curb appeal trends, and this year is no different. As a home’s visual introduction, landscaping is the first thing prospective buyers see. Aspects such as the layout and design, colors and combination of plants used, all play an important role in a home’s ability to provide a great first impression. One of the more popular landscaping trends of 2016 is integrating an edible garden in the front yard. (This can be especially powerful when selling a home in summer.) The aesthetics of a well arranged garden of fruits, berries, herbs and vegetables will not only serve as a feast for the eyes, but the belly as well. If you’re looking to breathe new light into your front yard, adding an edible garden is the way to go. That said, the types of vegetables and fruits you plant will depend on the time of year and your geographical location. In addition to improving the appearance, did you know that enhancing the landscape of a home can also increase its value? As one of the least expensive summer trends to undertake, good landscaping can add roughly 28 percent to the overall value of a home. That said, many experts recommend investing approximately 10 percent of the home’s current value into landscaping. Improving a home’s entry door continues to be one of the hottest summer curb appeal trends of the past few years, including one of the most popular summer home improvements as well. This year it makes the list, but not without a few additions. Typically speaking, one of the best home improvements to make, based on return on investment (ROI), is upgrading the front door. A steel entry door replacement, for example, will fetch a return of 91.1 percent, according to the national 2016 averages, with an approximate cost of $1,335, and resale value of $1,217. A fiberglass door, on the other hand, will earn a 82.3 percent return on investment. In addition to a remarkable ROI, there’s something to be said about the visual appeal a new front door brings. Homeowners looking to spruce up the summer curb appeal of their front door without upgrading to steel or fiberglass, can still do so by simply choosing a different style or color door to complement the existing siding. This option is more affordable and will still improve the dynamics of a home’s appearance. This is one of my favorite curb appeal trends for summer 2016, as it aims to mesh indoor living with the outdoors. Unlike the traditional family-sized backyards of yesterday, this trend is all about creating intimate outdoor gathering spaces. In most cases, it entails cozy seating areas and outdoor fireplaces or fire pits, while others include the addition of decks and patios as part of the outdoor living experience. Another 2016 summer trend includes installing a modern outdoor kitchen in the backyard. While the cost of this upgrade may be significant, the potential benefits of an outdoor kitchen are enormous, including the return on investment. Done right, an outdoor kitchen can earn a return as high as 200 percent in some cases. However, the investment is dependent on three factors: the scope of work, the location in which the home resides, and the intangible valuation of the owner — which plays a huge part in the resale. From large upgrades like porches and decks to smaller additions such as a fire pit, the trend of moving the indoors outside continues to rage on. One of the newest and predominately do-it-yourself summer curb appeal trends of 2016 is a customized home address. This modern curb appeal idea strives to infuse a homeowner’s personality with the style of the home, as well as making it more visible for visitors. Customized addresses have exploded on to the scene with countless styles, designs, shapes and colors to choose from, and are guaranteed to freshen up your home’s curb appeal immediately. Curb appeal, without a doubt, has an insurmountable role in a home’s appearance and first impression to the outside world. This year’s summer curb appeal trends look to not only enhance the look and feel of a property, but provide a return on investment. What are your favorite summer curb appeal trends of 2016?